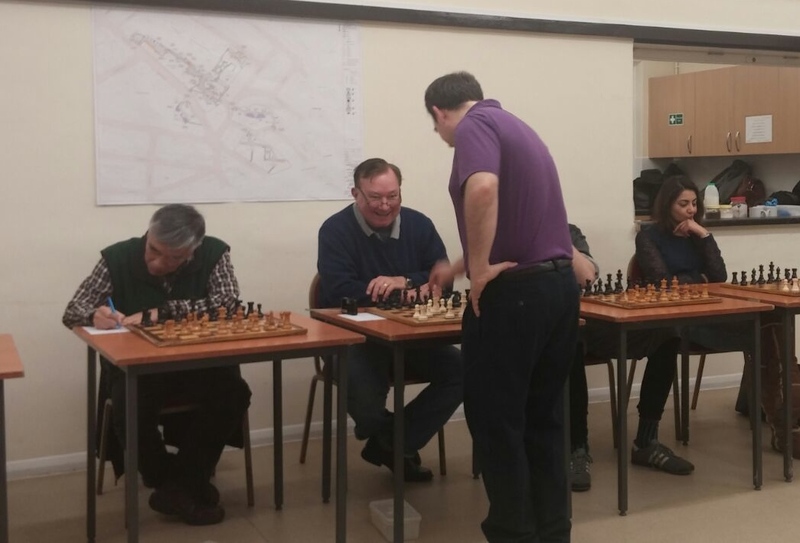 Am delighted to report that members of Hammersmith Chess club took on the ex-British Champion Grandmaster Chris Ward in a simultaneous match over 15 boards last night – 2nd February 2016. The whole evening took three hours and was a brilliant display of competitive and fighting chess… well, maybe on four of the 15 boards! The evening was great fun thanks to Chris who was very entertaining, very sporting and played some deadly chess. Pride of place goes to Carsten Pedersen, our club’s strongest player who not only beat Chris, but did so after getting an inferior position in the opening – amazing performance! Just behind him were the three stalwarts of the Club – Mike Mackenzie, our Club Secretary, Bajrush Kelmendi, our Chairman, and David Lambert, one of our team captains. Although they lost, they each played magnificently. Indeed Mike had a potentially won game but possibly over-excitement and with Chris posing him problems at every move, he ended up losing despite being ahead on material for much of the game. David played solidly all the way and only a clever tactic from Chris downed him in the endgame. Bajrush had an incredibly complicated game with Chris that was decided late into the evening when again, the expertise of Chris saw him secure the win. Fear the Benoni. Club Secretary Mike Mackenzie looking very pleased with his position early on. The rest of us were dispatched in regulation fashion. The reality is that a player of Chris’s ability sees so much more at the board than us club hackers. Take your correspondent – I was strategically lost after 7 moves – a hasty move saw to my downfall. A great night that will be repeated in future, and once again Hammersmith Chess Club must thank Chris for making it happen. 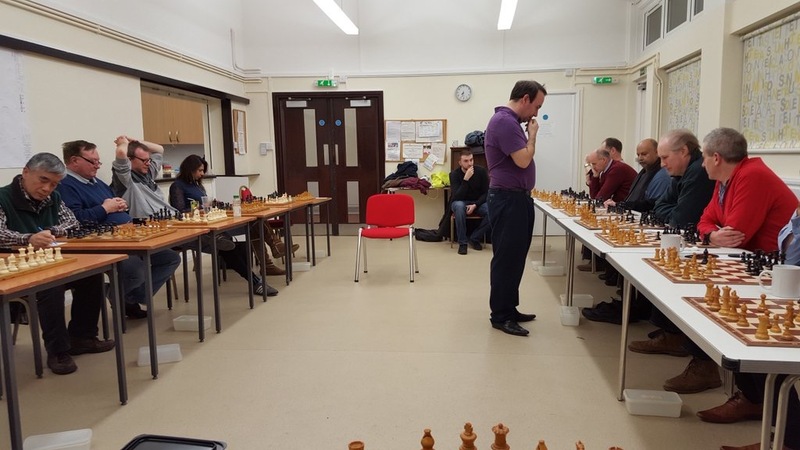 In what should be a truly captivating evening of Chess, Hammersmith Club players will be taking on Grandmaster (GM) Chris Ward in a 15 board simultaneous game at our Lytton Hall club venue (directions here) on Tuesday 2nd February from 6.30pm. A former British Champion, Chris is currently ranked in the top 30 British players and has a wealth of published material on the game, including a number of books on the Sicilian Dragon and Queen’s Gambit openings. Simultaneous (or Exhibition) games have a rich history amongst top ranked players, and have lead to some memorable exchanges with so-called lesser players. Bobby Fischer even included one game from an exhibition match (featuring the Evans Gambit), in his “60 Memorable Games” book. Hopefully one of the Hammersmith players can have a memorable evening! This is a fantastic and rare chance to play against a master of the game and promises to be a highlight for the Club. The Fulham Gazette will be covering this occasion for the local press. Hammersmith Chess Club is pleased to announce our new website.